SAN ANTONIO April 27th, 2010 - Softmath today announced availability of the latest version of its Algebrator™ software. 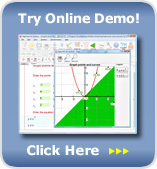 Algebrator 5.0 is a mathematics tutoring software program which solves and explains a wide range of problems entered by users of the program. Version 5.0 is equally suitable for grade school students, who can see basic arithmetic operations broken down to elementary steps, as well as for college students who need to brush up on trigonometry and statistics before taking a calculus class. Step-by-step solutions provided by Algebrator are virtually indistinguishable from the solutions given by the math teacher, making the software an ideal 24/7 math tutor. The software works seamlessly on both Windows and MAC based PCs. In addition to greatly expanding the covered math areas, Algebrator can now export its solution process to MathML – a standard format used for displaying mathematics on the web. In close collaboration with InftyReader Group, Inc., Softmath has developed a process that makes Algebrator's benefits available to students with vision impairment. "Softmath is making a concerted effort to make our software available to all segments of student populations. By teaming up with InftyReader Group, a company that markets an Optical Character Recognition (OCR) application that recognizes and translates scientific documents into LaTeX and MathML, we hope to continue our strong tradition of innovation", said Neven Jurkovic, Ph.D., president of Softmath. "It's been rewarding, working with Dr. Jurkovic, in support of helping to level the math playing field for students with print disabilities" said CEO of InftyReader Group, Inc. and president of IDEAL Group, Inc. In another effort to reach a traditionally underserved student population, Softmath will be releasing Algebrator 5.0 in both English and Spanish. Softmath is a leading provider of software for mathematics education. The company's flagship product is Algebrator, a math tutoring program which solves user-entered problems while teaching mathematics across a wide range of grade levels. InftyReader Group markets InftyReader, an Optical Character Recognition application that recognizes and translates math documents into LaTeX, XHTML (MathML) and MS Word 2007 (XML). Combination:A selection of objects from a collection. Order is irrelevant. Quadratic:1. adj. referring to second degree terms or equations. EX. Solve the quadratic equation `x^2-6x-16=0`. Polynomial:An algebraic term. The sum of 2 or more monomials. Polynomials include variables and always have one or more terms. Logical reasoning:The process of using a rational, systematic series of steps based on sound mathematical procedures to arrive at a conclusion; the drawing of conclusions from given facts and mathematical principles; often used as a problem solving strategy. Grade:The slope of a road, often represented as a percent or ratio. Mixed number:Numbers that have both whole numbers and decimals, such as 4.56. Math:Mathematics is the study of quantity, structure, space and change. It developed, through the use of abstraction and logical reasoning, from counting, calculation, measurement, and the study of the shapes and motions of physical objects. Simplifying:What is it? Reducing to lowest terms. Radical:The symbol ?? , which is used to represent the square root of a number, is called as Radical. Algebraic equation:an equation of the form f (x) = 0 where f is an polynomial. Table:Numbers or quantities arranged in rows and columns This is a table of what sport people play at a school. Variable:a letter that stands for a number or range of numbers. Fraction:Any part of a whole is called a fraction (e.g., one-half written in fractional form is 1/2. Variable:Letter used to represent a number. Calculator:Usually hand-held, pocket-sized electronic device for performing numerical calculations, organizing data, graphing functions, and/or performing symbolic manipulations. Simpler calculators can perform basic operations including addition, subtraction, multiplication, and division. More specialized calculators perform operations with squares, roots, certain trigonometric and statistical functions. They store and sort data lists or programs, and create an assortment of graphs. Algebra:The part of mathematics that deals with generalized arithmetic. Letters are used to denote variables and unknown numbers and to state general properties. Example: a(x + y) = ax + ay shows a relationship that is true for any numbers a, x and y. Adjective: algebraic. See also equation, formula, identity and expression. Exponential notation:A symbolic way of showing how many times a number or variable is used as a factor. In the notation 5^3, the exponent 3 shows that 5 is a factor used three times; that is 5^3 = 5 x 5 x 5 =125. Calculus:Calculus deals with limits, differentiation, and integration of functions of one or More variables. Equation:This is a mathematical sentence stating that two expressions are equal. Mode:What is it? In statistics, the value that occurs most frequently in a given series of numbers. Systems of equations:A group of two or more equations that share variables. The solution to a system of equations is an ordered number set that makes all of the equations true. Calculator:Calculator is a device that performs mathematical operations easily. Area:the size a surface takes up. Measured in square units. Object:The object of a transformation is the shape or set of points which is being transformed. The shape or set of points onto which it is transformed is called the image. Equation:A number sentence where both sides of the 'equal sign' (=) are equal. Imaginary number:Numbers that involve the imaginary unit 1, defined as the square root of?1. Rational expression:The quotient of two polynomials. Compound interest:Compound Interest is the Interest paid on both the principal and the Interest you earned so far on that principal. Cube root:The cube root of a number, n, is a number whose cube is that number. For example, the cube root of 8 is 2, since 2 x 2 x 2 = 8. In general, the cube root of n is a if a^3=n. Algebraic expression:A mathematical phrase involving at least one variable and sometimes numbers and operation symbols. Rate of change:The amount the function's output increases or decreases for each unit of change in the input. Simultaneous equations:a set of equations with the same unknowns (variables). Negative exponent:Used in scientific notation to designate a number smaller than one (1) (e.g., `3.45 x 10^-2` equals0.0345). Cubic function:A function that can be described by an equation of the form `y=ax^3 + bx^2 + cx + d`, where a ?? 0. Line:A straight path that does not have a beginning or an end. Solution:The solution to an equation or inequality is the number or set of numbers that work in the equation or inequality. Abstract:Intangible, not visible or touchable. Problem:A question to answer in mathematics. Problem:Problem is a question that is solved by using mathematics. Calculator:A machine used for doing mathematical calculations. Quadratic formula:The solutions of a quadratic equation in the form ax2 + bx + c =0 and b2 ? 4ac has to be greater than or equal to 0. Calculator:A calculator is a machine that solves math problems. Simultaneous equations:A set of two or more equations that contain two or more unknown quantities. Together, these equations specify conditions for these unknowns to satisfy at the same time. Graph:A graph is an image or chart representation used to show a numerical relationship. Remainder:The portion of the dividend that is not evenly divisible by the divisor. Answer:the solution to a problem. Polynomial:What is it? In algebra, a sum of monomials; for example, x 2 + 2xy + y 2. Algebra:Algebra is a continuation and extension of the rules of arithmetic into a more general level. Calculator:A machine for performing arithemtical calculations. Mathematics:A study of relationships among numbers, shapes, and patterns. Mathematics is used to count and measure things, to discover similarities and differences, to solve problems, and to learn about and organize the world. Algebra:A generalization of arithmetic in which letter symbols are used to represent unknown quantities so that we can generalize specific arithmetic relationships and patterns. For example, the arithmetic facts 3 + 3 + 3 + 3 = 4 x 3 and 5 + 5 + 5 + 5 = 4 x 5 are special cases of the algebraic statement z + z + z + z = 4z. Letters are used to denote any number, or any one of a certain set of numbers, such as all real numbers, to relate laws that hold for any numbers in the set. Algebra:Hold it. If you don't know what algebra is (a bunch of letters like x and y and a bunch of rules for playing around with them), then you shouldn't be taking calculus. Return to GO, do not collect 0. Each:every one considered separately or one by one. Systems of equations:More than one equation that are solved simultaneously. Multiplication:the operation of repeated addition. Greatest common factor:The largest integer that divides evenly into each of a given set of numbers. Often abbreviated GCF or gcf. Subtracting integers:To find the difference of two integers, change subtraction to addition by adding the opposite of the second integer, then follow the rules for adding integers. Quadratic equation:An equation that has one pronumeral raised to a power of two. All other powers are 1 or 0. Linear function:A function of the type y = f(x) = ax + b because its graph is a straight line. Quadratic function:A function given by a polynomial of degree 2. Fraction:What is it? A number used to name a part of a group or a whole. The number below the division line is the denominator, and the number above the division line is the numerator. Function:a relationship between input and output. Definition:A description that clearly and uniquely specifies an object or a class of objects. Variable:A symbol used to represent a value. Letters can stand for many different numbers. Construct:To draw accurately using geometrical equipment or computer software. Algebra:A branch of mathematics in which variables are substituted for unknown values to solve a particular problem. Solution:A solution is the line of reasoning which gives the answer to a mathematical problem. It is also used for the finals answer if there is one. Consider, for example, the line of reasoning to find the value of x to satisfy the equation 3(x - 4) = x - 6. Multiplying out the bracket gives 3x - 12 = x - 6 Adding 12 and taking away x gives 3x - x = 12 - 6 Simplifying gives 2x = 6 Dividing by 2 gives x = 3 Then x = 3 is the solution of the equation.